*IMPORTANT - The information provided below is based on the program requirements for students who entered prior to 2017. This information is relevant for students currently completing an Honours Thesis through PSYC 4000. NOTE: PSYC 4000 - Honours Thesis (as well as PSYC 4170 - Advanced Research in Psychology) will not be offered as of Fall 2019. If you are interested in completing an Honours Thesis, please apply to the Specialized Honours program. More information is provided in our Degree Requirements by Program section. 1. What is an Honours thesis? Am I eligible to do an Honours thesis? Should I do an Honours thesis? All students should begin by reading the Honours thesis handbook and download the tipsheet on what is the difference between PSYC 4000 & PSYC 4170. 2. Where can I review archived Honours Theses? To review Honours thesis written by past students visit the Psychology Resource Center in room 162B B.S.B. 3. Are you having trouble getting started or finding articles on your research topic? Scheduled through the library and taking place in Scott Library (Room 531) in the Fall term are advanced hands-on research workshops that cover topics such as literature searching using major databases such as PsycINFO and Medline, citation searching using Web of Science, finding and using psychological tests, setting up alerts on research topics, and library services such as interlibrary loan. 4. Ethics Approval Process: Research by Undergraduate Students. To obtain ethics approval all students are required to read and conform to research ethics and ethics review procedures. 5. Need help with Statistical analysis? The Statistical Consulting Service ( SCS ) at York University is offering workshops and drop-in statistical consulting exclusively for 4th year students enrolled in PSYC 4000, 4001, 4170 and 4175. 6. Funding opportunities for undergraduate thesis research ? Pestano, Assistant to the Chair, Rm. 292 Behavioral Science building. 7. Require help writing your Honours thesis? To get help with writing in general see the etutoring or workshops available through the writing department (located at s329 Ross Building). In addition, there are a number of online resources available to you to help you to write your thesis following APA formatting and style as outlined in the Publication Manual of the American Psychological Association (2009). There is succinct information on APA style punctuation, information about the main sections of a manuscript, an APA Style and formatting guide updated with 6th edition APA manual information at the OWL website which describes general APA writing guidelines and where if you look under Research and Citation you can find the most up to date way for citing your sources. The information from the APA manual has been summarized in a writing handout based on the 6th edition APA manual that also describes some useful information for writing your thesis. Given that the manual is over 400 pages in length, there is a lot of information not covered in the aforementioned resources. Therefore, the ultimate authority is the APA pubication manual. In order to truly understand and learn the APA style of writing you should look at and perhaps even purchase a copy of the Publication Manual of the American Psychological Association because it will be a good reference book for graduate school. There are about 7 copies of the 6th edition of the manual available in the libraries on campus, some of which have been placed on reserve. Note that if your thesis is outstanding you should consider submitting it to the Yale Review of Undergraduate Research in Psychology. This is an annual journal that showcases the best and most original research in psychology conducted by undergraduates from around the world. They provide a platform for undergraduate scientists to share their findings, and aim to bring together a community of young psychologists from both the United States and abroad. Published undergraduate theses are now available for your perusal - one of which is from our 2008/9 thesis student cohort (see the one authored by S. Luca). Deadline for submissions are usually around mid April. See their website for details about submission guidelines. Visit workshops site for additional information. 8. How to create a poster ? 9. Advance library research workshops 2012 intended for students completing their Honours thesis. Are you looking to improve the quality of your research papers? Would you like to impress your professor with a solid literature review? Would identifying relevant and available psychological tests take your research up a notch? Does doing all the above more efficiently and with less frustration sound appealing? It will be hands-on in a computer lab and you are encouraged to ask questions. Ideally, you will come prepared with a research topic for the purposes of hands-on practice during the class, but don’t hesitate to sign up for a session even if you only have some initial thoughts about the directions that your research may take you. Each workshop covers identical content (so only sign up for one) and is held in Scott Library. Questions? Please contact Adam Taves, Psychology Librarian, taves@yorku.ca. Psychology department poster day event & Richard Goranson Memorial Psychology Honours Thesis Poster Award. 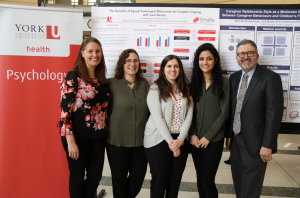 Psychology department Poster day 2018 was held at Vari Hall Rotunda, view 2018 Psychology department Poster day event photo album. Although there were many outstanding posters, the judges were able to select two for the Richard Goranson Memorial Psychology Honours Thesis Poster Award. Photo above left to right: Dr.Jennifer Steele, Dr. Jill Rich, Amanda Bockaj, Marette Abdelmaseh and Dr. Joel Goldberg Chair of York university department of Psychology.